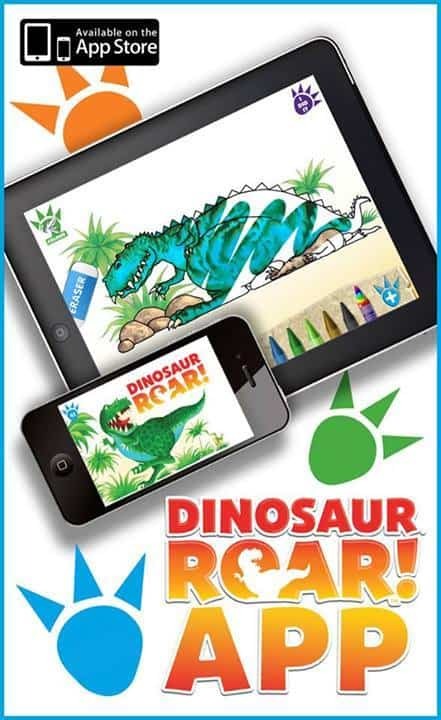 Last week saw the release of a new app, Dinosaur Roar! The app is inspired by the iconic picture book which as this iconic children’s title marks its 20th Nurture Rights have appointed Penguin Random House as the new publishers, and have also teamed up with the Natural History Museum to develop and market the Dinosaur Roar! brand. To get your hands on a copy of special 20th anniversary edition please head over to the Random House online store. Using Paul Stickland’s original designs and Henrietta Stickland’s wonderful rhyming text, the app is aimed at 2-4 year olds and incorporates different storytelling functions, creative colouring options, as well as a fun ‘shake and name’ device. 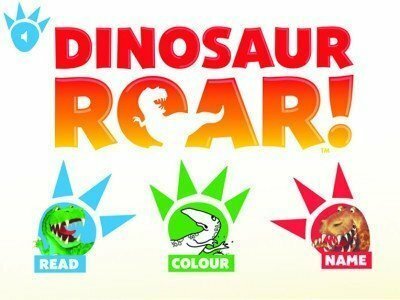 Children can watch, hear, colour in and touch their favourite dinosaurs as they stomp, shuffle, run, chomp, blink, squeak and roar their way across the screen. Follow the story narrated by a child’s voice, or alternatively you can read the story yourself – with the option to record and save – while the innovative scrolling function takes you on a continuous journey through the dinosaurs’ world. 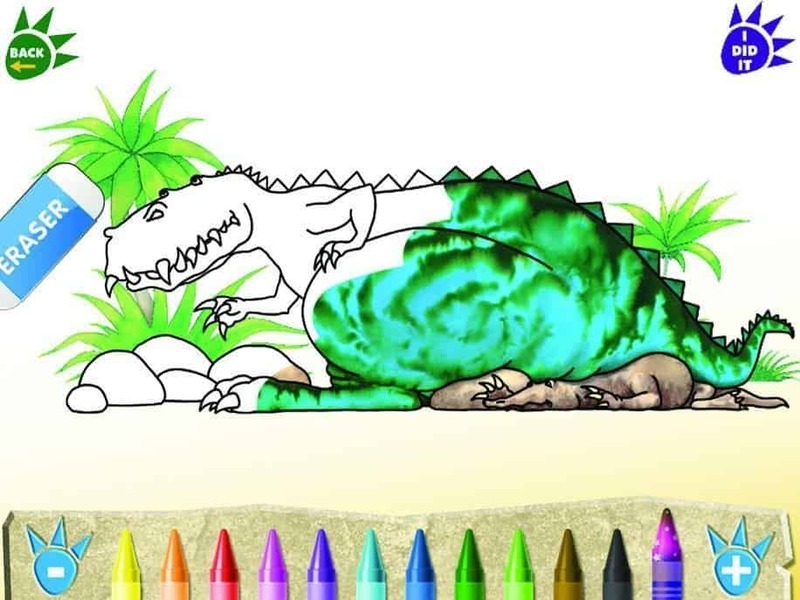 For colouring fun, simply select your favourite dinosaur from the menu, then using your fingers to add colours and patterns, you can recreate the original, or be as creative and colourful as you like. A save function allows you to preserve your mini-masterpiece, plus each dinosaur can be coloured in again and again (and again)! The name function is great fun too, simply type in your name, shake the screen and you will receive your dinosaur name. Tigger found it most amusing when I read out that is was now to be called Tigger-o-saurus! As the app is aimed at 2-4 year olds, Tigger fits that category quite nicely and it was great to see him interact with a classic story book brought to life through the app. Roo managed to get involved in the action too by reading and recording her voice which Tigger could then play back and listen to Roo even when she was out at school. The name function has to be funniest part of the app for me personally, both Roo and Tigger were asking me to type in all the family names to see what their dinosaur name would be. The app is currently only available on Apple products from the App store, priced at just £1.99. Dinosaur Roar! App – Nation’s Fiercest Roar! To celebrate the launch of the brand new Dinosaur Roar! App, they looking for the nation’s fiercest roar. Parents everywhere can enter their child to win an iPad Mini, lots of Dinosaur Roar! goodies, and the chance to feature on the app. Parents simply have to record a short video of their child letting out a ferocious dinosaur roar, and share the clip for their chance to win. They are looking for the loudest, squeakiest, fiercest, grumpiest, longest, dinosaur, as judged by Paul Stickland, so keep an eye out! Disclosure: We received the app and a Dinosaur Roar! goodie FOC for the purpose of this review. Awwww! This brings back memories- Seren had the book as part of her first BookStart pack- it remains a favourite. We’ve been having fun with it in this household too! Send a BIG ROAR! to Roo and Tigger!